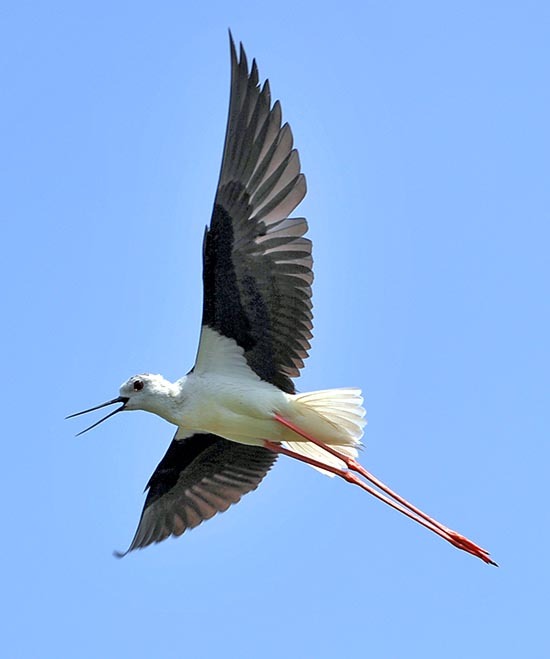 The Common stilt (Himantopus himantopus Linnaeus, 1758) belongs to the order of the Charadriiformes and to the family of the Recurvirostridae and is one of the strangest birds crossing our skies. To see it walking on those outsized stilts, as long as its body, of scarlet red colour, is already a spectacular sight. And in flight it becomes even funny with these same legs protruding beyond the tail for almost 15 cm, as if it was dragging some red laces remained accidentally entangled and that seem to hamper and to unbalance it during its flight manœuvres. Also those who in the old times have had the pleasure to study it and to classify it, took the inspiration from this unusual but impressive particular. Actually already from the scientific name and then from the common names that have been given, ere evident these particulars. Himantopus comes from the Greek “himas, himantos” = belt, lace and “pous” = paw. The paws similar to two laces is a concept that had been still stressed by Pliny who, metaphorically, indicated these appendages “thin like strings cut from a leather strap”. The way it has of walking and the extreme elegance of its look, have raised it, only in Italy, to the rank of cavalier! In other common European names are instead described some other morphological characteristics but never with the Italian poetical emphasis. In English Black-winged stilt; in French Echasse blanche; in German Stelzenläufer; in Spanish Cigüeñuela Común; and in Italian Cavaliere d’Italia. Since always known in the central-southern part of the Italian peninsula, is nowadays well diffused also in the north in a phase that sees it in high expansion northwards in all its traditional areals. The common stilt has a very ample area of diffusion covering practically all continents. It lives from North America to Australia, from South Africa to China, from New Zealand to Europe, from Madagascar up to the Pacific Ocean islands. In Europe it goes up to England and in all the continental area but is absent in the Scandinavian Peninsula. It is basically a cosmopolitan bird with sedentary populations in the tropical zones and migrant in the temperate areas. The European population and partially the Asian Middle East one, migrates in Africa in the sub-Saharan area going also in the austral one, whilst the Asian population hibernates in the Indo-Malay area, both overlapping to the resident populations. It gets in the nidification places since the month of March remaining there up to late August-early September, month during which all the population abandons finally leaves the summer area. Once occasional in the Po Valley, is nowadays very common, in some cases with spectacular concentrations: 27 nests in 3,3 ha and 14 nests in 1,4 ha (Colombo 2011). Both cases are referred to tending for the hunt to the anatids. 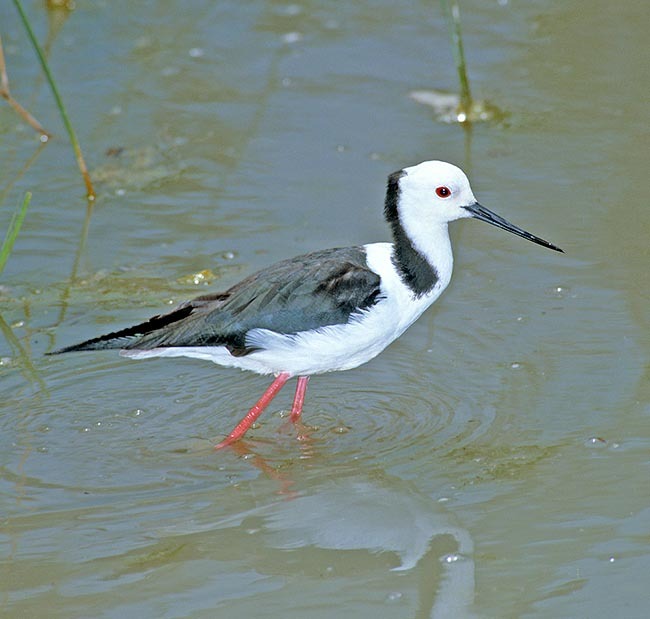 The common stilt usually lives in swamps, rice fields and salt marshes, shallow lagoons, sandy and stony banks of watersheds and during the last years, in particular in the Po Valley, in the nets for hunting ducks, seen that the arrival of the migratory populations coincides with period of closure of the hunting season. It is a limicolous strictly linked to the presence of water and to any ambient having availability of this element. The particular length of the legs allow it to take advantage also of stretches of water of a good depth, usually exploited only by large ardeids, where we can see it wallowing with the water reaching the chest and sometimes disappearing under water leaving only the tail visible, when plunges the head looking for food. It eats everything that lives and is correlated with water: insects, small snails, crustaceans, mollusks and tadpoles, food it collects during the day as well the night considered its capacity to see discretely also in the darkness. Its daily activity consists basically in two phases, eating and cleaning itself, spacing all with quite lively social activities. 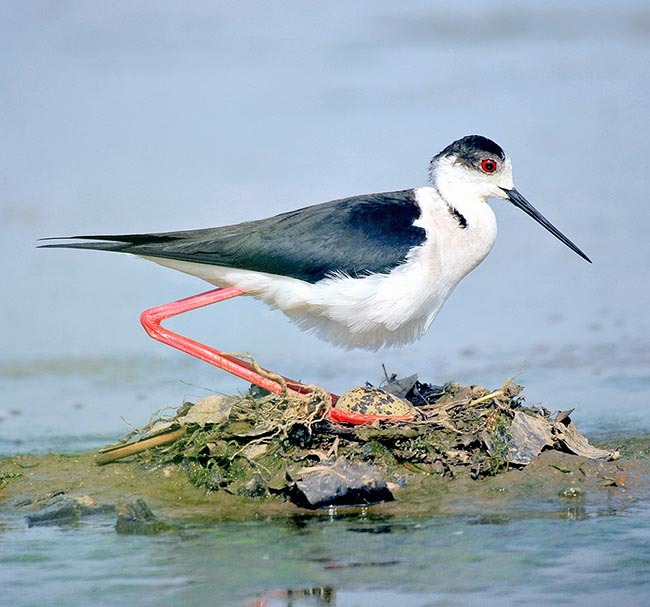 This bird has a very strong community life but in the mean time is very quarrelsome with all its neighbors, stilts as well as other birds transiting its area. This behavior, though much marked during the nidification period, is evidenced in every moment of its life and therefore it is thought that at times these are “friendly” quarrels to further tighten the group relations. In any case, its aggressivity is shown also towards birds of much higher size and with by sure not friendly characters. Herons, coots, ducks and not rarely kestrels (Falco tinnunculus) and hobbies (Falco subbuteo) are the main dispute attractions. Conversely, in the case of appearance of the western marsh harriers (Circus aeruginosus) and of the harriers (Circus sp. ), often predators of the nests and of its chicks, the attack is done in group with a strict and determined mobbing, even if although sometimes unsuccessful. 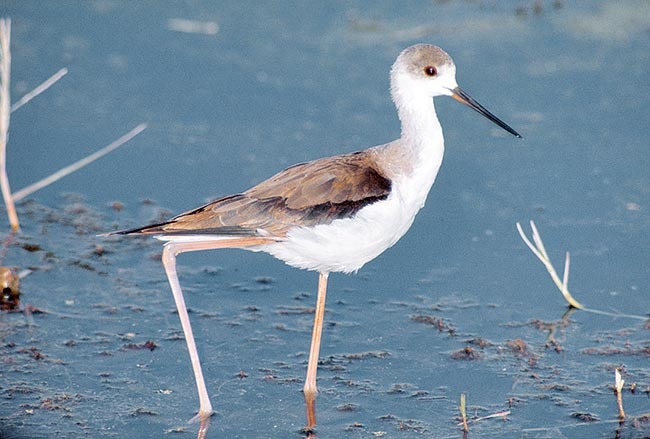 The common stilt has a length of almost 40 cm, a weight of 200 g and a wingspan of about 75 cm. Only its legs have a length of 30 cm and contribute on the average of the 30% of the total length. The alar coverts are very black in the make and slightly duller in the female. The remainder of the body is white candid but some much variable blackish spots on head and nape. These nuances often indicate the belonging to the different sexes but inevitably are found on males as well as females with these spots more or less marked and at times specimens of both sexes totally missing. On the contrary, the immature have a greater shade in the white black contrast, with a diffused grey that in the very young specimens make it look more to a spotted redshank (Tringa erythropus) in eclipsal livery than to a future common stilt. The very pointed beak is black and slightly longer than the head. The legs are fire red. The eyes have the iris of bright red colour that is strongly evidenced when in phase of mating or when excited by the presence of some intruder. Several subspecies have been classified scattered in various remote and isolated sites of the world and by some considered at the level of species. 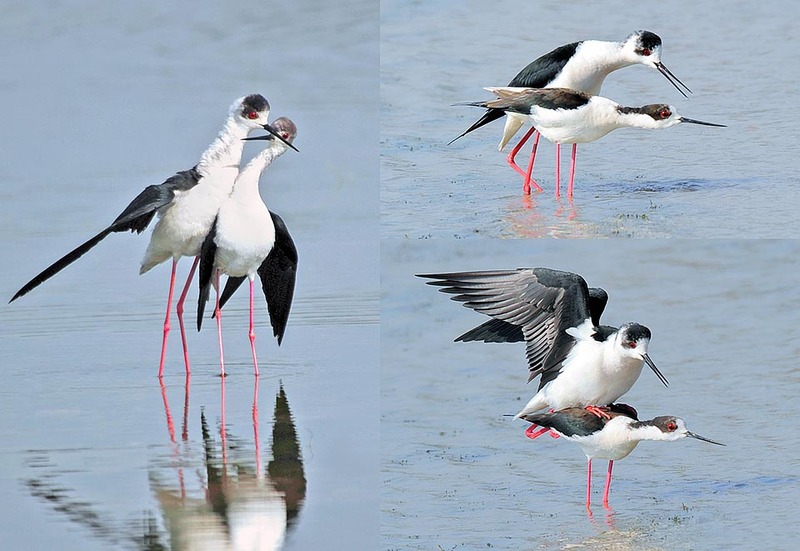 Immediately upon the arrival in the nidification quarters, the male stilt takes possession of the area choosing the female, its future partner, and detecting the corner where to build the nest. In this period are triggered incessant and cackling struggles for the conquest of the territory and the defense of the chosen female, battles during which these birds use the wings and the legs like swords for defending from the enemy and intertwine flights creating very funny turmoils. In these struggles the winner usually manages to “drown” the contender, throwing it practically underwater and pressing its body with the long legs. Immediately after this, the peace gets back and all comes back as if nothing had happened. The mating of these birds is very particular and moving. The male begins to turn around the female pecking nervously at every step and tightening more and more the approach circle. The female keeps motionless and slightly bent, with the head leaning forward and the body perfectly horizontal to the soil till when the male, risen on the back, consumes the mating in very few seconds. When back on the ground, embraces the female spreading out one wing and walking some steps paired. During these phases both partners keep the eye greatly wide evidencing the carmine red of the iris. When possible, it chooses nidification sites that are or may become inaccessible from the ground therefore it identifies flooded areas or in flooding phase, surrounded by impassable or clearly impracticable, muddy layers, so that the nest, though visible, will remain basically surrounded and protected by the water. The fox is one of its main predators an in fact, when not protected by these obstacles, it often becomes its easy prey. Nidifying in even numerous colonies, the nests are often close, even at a metre of distance and the common protection becomes consequently a very valid help. It must be said that this white black bird is quite visible when crouched on the nest, and therefore is an easy target for any type of predator, from top as well from the ground. 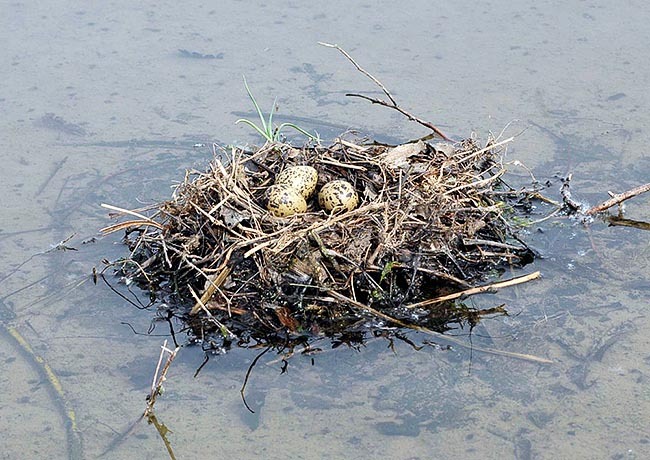 The nest is a mass of grasses and algae when it’s placed in the water, whilst the materials are partially replaced with pebbles, shells and wild rabbit dung when located in a dry position. It lays up to 5 eggs, three or four as an average, of olive base colour, strongly spotted of black, that are brooded for about 25 days. The small nidifugous leave the nest immediately but depend from the parents for 4-5 weeks more, when they will be able to fly. The mortality of the young during this period is exceptionally high even if mimicry is one of their peculiar characteristics. 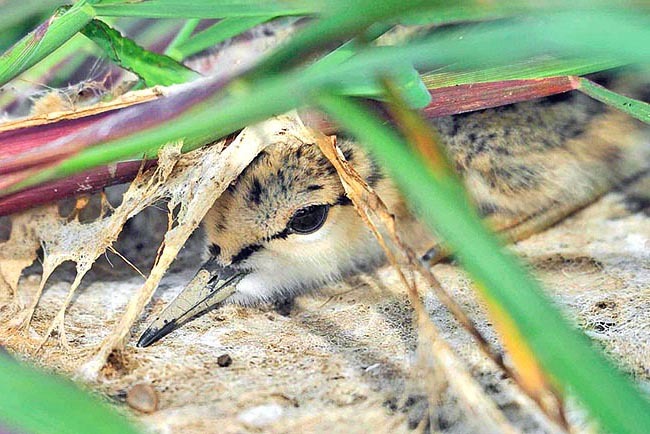 The common stilt may be able to perform a replacement hatching if the nest is accidentally predated or destroyed during the initial phase of the nidification. The common stilt cannot count contrary to many birds that can do this easily and therefore is not troubled at all if when back to the nest it does not find the number of eggs it had left. From the four eggs usually forming a brood, they have tried to gradually take off one at a time and to immediately see the bird coming bach and crouching on the nest with no hesitation. Conversely, when all eggs have been taken off, the bird stops at once in front of the nest and, after some minutes of disbelief, resumes its normal activities staying close to it. Placed again immediately the eggs, it gets back with incredible rapidity to the nest and restarts hatching as nothing had happened. Also when the nest is accidentally damaged by floodings or snatched by predators, the reaction is quite rapid. Once the incident drama past and after a stay in loco of one or two days at most, with frequent visits to the empty nest but most probably for still defending the territory, almost immediately the male begins to identify the new place where to build the new nest and to begin at once accumulating material close to it. The nest building is a common work and is done quite rapidly and in a very few days the redeposition of the eggs takes place. At times, when the loss of the brood is due to a sudden flood, it does not fail to use, once waters have gone, the same platform where the previous nest was located putting in place new material to integrate what has remained. The sexual maturity is reached on the second year but usually the choice of the partner and the mating occur on the third year. 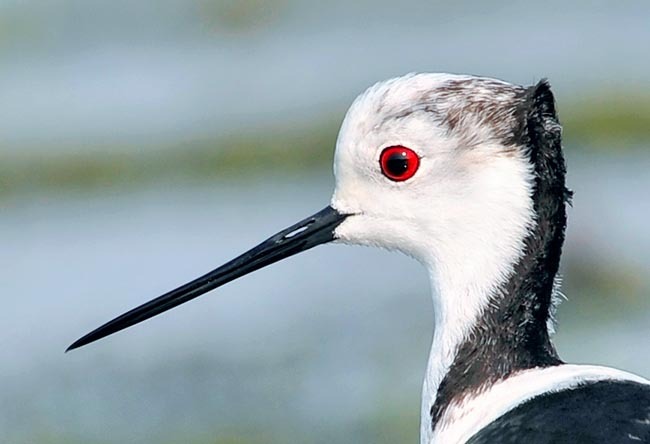 During these years the subadults common stilt may keep in the hibernation sites or also may follow the nidifying pairs in the reproductive area, where often they stand among the causes of those very frequent quarrels these birds are subject. Many young once independent, after the initial time of wandering among the various colonies, often do join other familiar groups, creating groups that will be essential during the long migration. This species is in high expansion in particular in all the northern areals, therefore is not considered as endangered. In any case, it is particularly protected all over Europe.